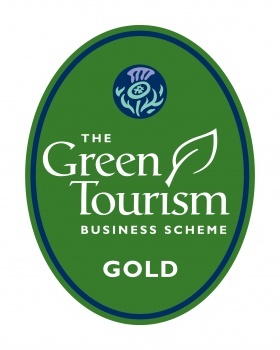 Earlier this year, we commenced our journey with Green Tourism and were thrilled to receive the Silver Award. Since then, we have embarked on many changes and improvements on our way towards Gold. To be awarded Gold, you don’t need to implement massive changes like solar panels (although we are looking into them!) Instead, you need to demonstrate commitment and efforts to building a green and sustainable business. So we are super thrilled to have received the Gold Award in November 2018. Award holders need to champion investment and improvement in the local community. We use a lot of our time and energy to help build stronger communities. For example, Jane regularly bakes cakes for, and volunteers at, the the local community cafe in Kirkhill. We also have to help conserve the local economy by introducing and encouraging guests to try genuine local experiences; and to source products sustainably and ethically. And through all this, we are committed to finding new ways to reduce our footprint, and to lessen the impact we have on our environment. Green Tourism is the largest and most established sustainable certification programme in the world. Green Tourism exists to help tourism businesses ensure their long-term viability, both environmentally and economically; and to help holiday makers make clear ethical, sustainable and responsible decisions about where to holiday or visit. We are looking into even more changes and improvements to continue our journey. And we will always encourage guests to think about being eco-friendly. 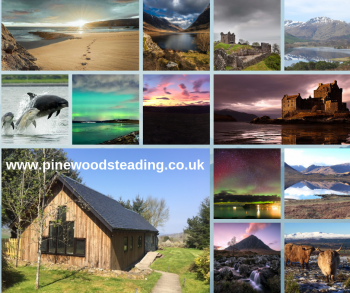 Check out our Green page for our green credentials. 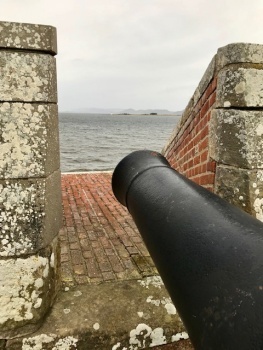 On a very windy October day, we took ourselves off to Fort George, just outside Ardersier, near Inverness. We were amazed by how big this fortification is! Built in the wake of the Battle of Culloden in 1746, the fort is still used as a British Army establishment. Bonnie Prince Charlie was defeated at Culloden, so George II created this imposing fort against further Jacobite unrest. But after taking 22 years to complete, the Jacobite thread had subsided. Quick side note: combine this with a visit to Culloden Battlefield. 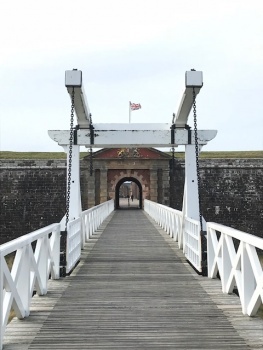 There is so much to see and do at Fort George, we were really impressed and truly great value at £9.00 for an adult ticket. The main rampart is more than 1km in length and a super walk with great views – many across the Moray Firth, which in itself brings an opportunity to spot the dolphins! It has a great Highlanders Museum – Scotland’s largest regimental museum outside of Edinburgh. 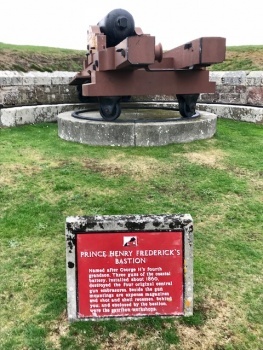 The museum covers three floors of Fort George’s former Lieutenant Governors’ House and has over 20,000 artefacts and over 10,000 documents and photographs. The garrison chapel at the far end of the fort was worth the walk. Although you can’t actually get to it, look over the ramparts and see the dog cemetery – one of only two in Scotland – where regimental dogs have been buried. There are lots of plaques around the entire fort, giving the history and also explaining about the weapons, cannons, barrack rooms, living quarters, and showcasing the story of what life would have been like for the soldiers serving. All the garrison buildings, artillery defences, bayoneted muskets, and swords provide an incredible view into 18th century military life. We took the audio headsets for free. Many of the plaques have a corresponding number which you hit to get the audio story. Very useful and highly informative. There’s a little shop too and a café. The fort is very exposed on the peninsula overlooking the Moray Firth. It was incredibly windy the day we went so be wary of this. An amazing place to visit.